I think one really fun and also super annoying thing about being married to someone is that you are permanent roommates. Impromptu dance parties when Nelly comes on Pandora. Drinking and watching Netflix and not having to drive home. When you have an itch right in the middle of your back and you can’t reach it yourself. Throwing food in the air so the other one can try to catch it in their mouth. Having someone around who understands any minor feelings of hostility you may have toward your children. My favorite account of this was when Avery was being a brat to me at dinnertime and I was trying to keep my cool. Kevin grabbed a bag of broccoli and dramatically pretended to hit her over the head with it behind her back, all while she was still rattling off her snotty demands, completely unaware. Now that is the kind of parenting move that builds camaraderie. Constant scolding for not parking far enough over on your side of the garage. How much precision is really required here? What am I, an astronaut? This is the kind of thing that I categorize in the SUPER fun part of being married to your roommate. I live for the times when he talks in his sleep because I find it so thrilling. I carry on the conversation as long as possible with the delicateness of a bomb defuser so as not to wake him, gleaning as much information from his subconscious as I can. Although it’s not always fun. Once, when Avery was a newborn and still sleeping in a cosleeper in our bed, I made Kevin go to the guest room so one of us would actually get some rest after what had already been a long night of feedings and diaper changes. I woke up shortly thereafter to Kevin standing over me, cradling a pillow and mumbling robotically, “Take the baby…take the baby.” A chill of panic shot through me as I pictured our newborn baby decoratively arranged on the guest bed where the pillow had been. To this day, I’m not sure if this was the act of an exhausted, sleep-walking new father or the scam of an evil genius, but he was never in charge of getting up during the night ever again. Well played, Roomie. 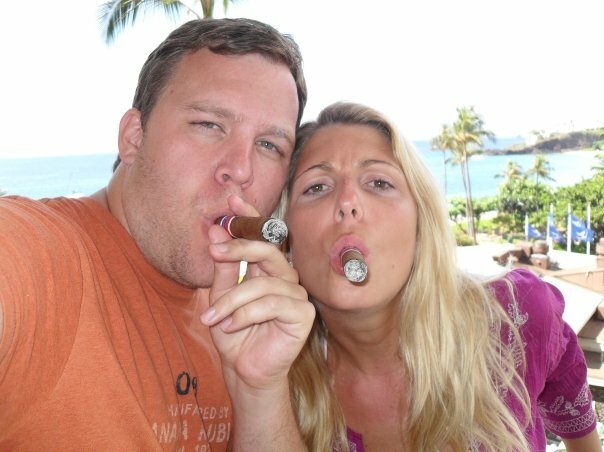 From our honeymoon in Maui 2009: Roomiez 4 Lyfe.